Toronto's new mayor says we are a "divided" city—and few subjects divide us like policing. Last Tuesday, 2,000 people gathered in downtown Toronto to protest a Missouri grand jury’s decision not to pursue charges against police officer Darren Wilson in the shooting death of Michael Brown. The group rallied against police brutality and racial profiling in Ferguson, as well as issues closer to home—including the Toronto Police Service’s practice of carding black youths, and the police actions that led to the deaths of Sammy Yatim and Michael Eligon. Less than a week later, an Ontario judge handed down a sentence to a Toronto police officer who pled guilty to punching a drunk, handcuffed man—who suffered a concussion in the event—nine times. The officer’s punishment: a few months’ probation, and a $50 fine. With protests across the U.S. and beyond over the decision in Ferguson, and mass demonstrations against government corruption and police violence in Mexico, the past month has constituted something of a watershed moment for police accountability. Even in Toronto, a number of opportunities for police reform have arisen: a new mayor, new appointees to the Toronto Police Services Board (TPSB), and a relatively new carding policy. And with Chief Bill Blair’s term ending in April 2015, the city will soon have a new police chief. This focus on policing is something Toronto desperately needs. As TPSB chair Alok Mukherjee noted at the most recent board meeting, “a crisis of confidence” exists between Toronto police and the communities they are supposed to serve and protect. The police brutality seen during the G20 summit and the deaths of a number of mentally unstable people at the hands of TPS officers have kept the issue in the public eye. The Toronto Star’s series Known to Police, meanwhile, revealed the extent of TPS racial profiling: proportionally, more young black men have been carded in Toronto than have been subjected to New York City’s controversial stop-and-frisk program, which Mayor Bill de Blasio has vowed to end. Although the board has pushed to reform carding and introduce new bias-free policing procedures, the problems nevertheless appear to be getting worse. A report commissioned by the TPSB and released last month revealed that officers in the Jane and Finch area spent all summer refusing to follow the new carding procedures: they continued to stop and question youth without a valid public-safety reason, continued to refuse to tell them why they were being stopped, and failed to provide them with the mandatory receipts that include their badge number and division [PDF]. When faced with the results of the report, Blair chose simply to reject the findings. This strained environment—in which a police chief can dismiss findings with a wave of his hand, and an officer with a record of assaulting people is praised by a judge for doing “the right thing” by admitting that he’d beat a handcuffed man—is the one Tory is set to wade into. Noting that he was “not at all satisfied with the overall state of the relationship between the Police Services Board, the police service itself, and the community,” Tory announced four days ago that he would sit on the board himself. That decision, and the decision to replace Frances Nunziata (Ward 11, York South-Weston) and Michael Thompson (Ward 37, Scarborough Centre) with councillors Shelley Carroll (Ward 33, Don Valley East) and Chin Lee (Ward 41, Scarborough-Rouge River), can be interpreted with either cynicism or hope. On the one hand, Tory’s move demonstrates a commitment to addressing policing issues in Toronto (his predecessor Rob Ford did not sit on the board, instead appointing Thompson as his delegate). Tory has stated that he supports carding reform, though he has stopped short of denouncing it altogether. His appointment of Carroll, who found significant efficiencies during her term as budget chief and argued for trimming policing costs in 2010, suggests he may be brave enough to tackle the behemoth that is the $1.08-billion police budget. Still, Tory’s appetite for change when it comes to policing raises significant concerns. While running for mayor, Tory said he would support a renewal of Chief Blair’s contract, which suggests that he sides more with Blair’s status-quo approach to carding than with Mukherjee’s commitment to reform. His decision to remove Thompson from the board is also troubling. Not only has Thompson been an outspoken advocate for carding reform and an end to racial profiling, he’s also the only black member of city council. Then there’s Tory’s denial of the concept of white privilege—an important issue in a city where black people are more likely than white people to be stopped and questioned by police in all 72 patrol zones. Still, there’s a lot Tory can do to improve the tense relationship between the chief of police and the board, and between police officers and communities. Ensuring carding reform is paramount: not only should Tory champion the reforms passed by the board in April, but he should also push for more accountability for officers, and continue to commission and review independent research reports on policing practices. At the same time, the police service itself must enforce the new policies. Some measures, such as body-worn cameras, can improve accountability, but there must also be serious consequences for officers who turn their cameras off while on duty. With the current chief out in April, the time is also right for Tory to suggest an independent review of Blair’s brainchild, the Toronto Anti-Violence Intervention Strategy (TAVIS). TAVIS units card young black men at a higher rate than do other units, and are the subject of at least one lawsuit alleging police brutality. 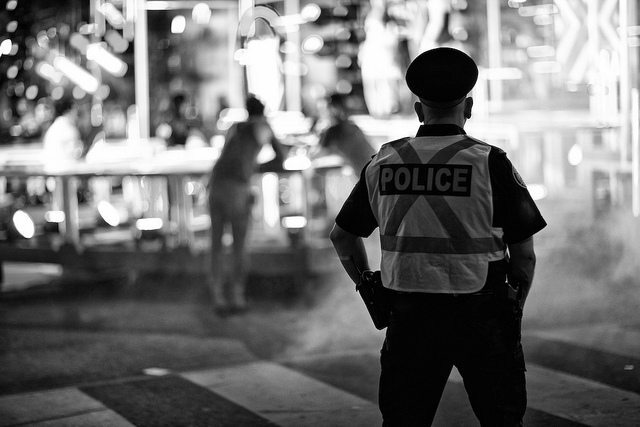 With Toronto consistently reporting the lowest crime rate among Canadian municipalities, TAVIS’s operations merit considerable scrutiny. Over the past year, much has been written about our “divided” city. Few issues exemplify that divide like policing does, with its disproportionate impact on low-income and black communities located outside of the downtown core. If Tory is truly committed to building “one Toronto,” reforming police practices would be a good place to start. Wyndham Bettencourt-McCarthy is a former Torontoist contributor and a member of the Policing Literacy Initiative. What if Firefighters and Paramedics “Modernized” their Vehicles the Same Way as the Police?